If you require help while playing a game, click on the Info button to get a popup help page. The settings button is located between the Info and Sound buttons. Click on the settings button to get a popup of options to help you customize your EuroMania.com environment. Click on the sound to display a slider that will allow you to increase or decrease the overall volume of the EuroMania.com games and lobby. 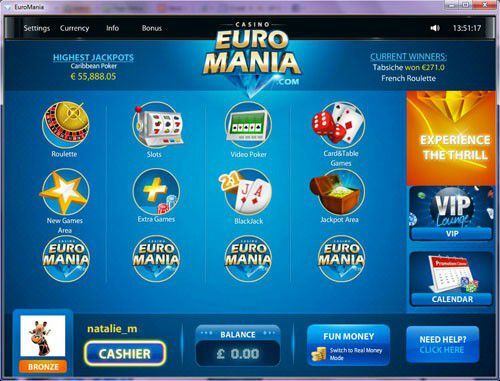 Use the Cashier button located at the bottom left of the screen to access your EuroMania.com account and make deposits or withdrawals.